I heard my song on the radio! I heard my song for the first time on the radio :-) My manager Tray and I had just finished up some work, and we were sitting hanging out, with Sirius XM’s Heart & Soul station playing in the background. They were getting it IN! We heard Brian McKnight, then Billie Ocean, which made me laugh. So as I’m listening to the music it fades out and I hear my name. Huh? It came from the radio!!! OH! 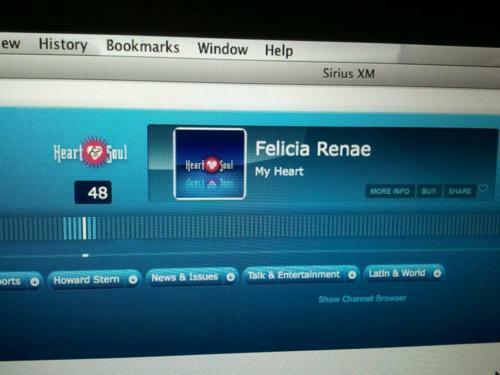 The announcer said “I’ve got a song by a new artist named Felicia Renae up next…” AHHHH!!! Yes. I shrieked like a little girl. No, it wasn’t a complete surprise, we knew it was in rotation and we’d already heard from friends & family telling us they’d heard it on the station, but it didn’t really click completely til I heard it too. That is one thing you can pretty much depend on: me being a great big ball of emotions :-) but I’m getting to the point where I’m pretty cool with who I am, emotions and all. Its nice to hear the fruit of your labor in action. I’m glad they’re playing it on the radio. Now I hope the world loves it & it means something to someone out there because that’s the reason I do this. I write and sing so that I can share what I feel with anyone that wants to listen, and hopefully we can connect when we have those songs/thoughts/experiences in common. Writing “My Heart” was so hard for me. But I did it because I knew I had to. Because that feeling and experience made me tell myself to truth and about & when to love. And who. And the ONLY thing that made me walk into the booth and record it was knowing that it might help someone go thru it too. To help them get thru it and get to what’s right for them. For the right reason, I can do that. I can handle being a little emotionally naked for a few minutes if its going to help someone else get thru it.